MADISON — Not all smiles are expressions of warmth and joy. Sometimes they can be downright mean. And our bodies react differently depending on the message a smile is meant to send. 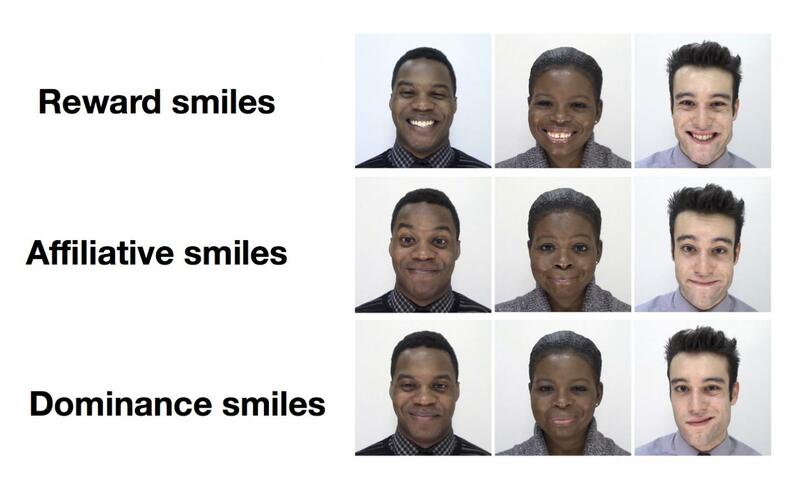 Research led by Jared Martin, a psychology graduate student at the University of Wisconsin-Madison, shows that smiles meant to convey dominance are associated with a physical reaction — a spike in stress hormones — in their targets. On the other hand, smiles intended as a reward, to reinforce behavior, appear to physically buffer recipients against stress. "Facial expressions really do regulate the world. We have that intuition, but there hasn't been a lot of science behind it," says Martin, whose study was published today by the journal Scientific Reports. "Our results show that subtle differences in the way you make facial expressions while someone is talking to you can fundamentally change their experience, their body, and the way they feel like you're evaluating them." Martin works in the lab of UW-Madison psychology professor — and co-author on the study — Paula Niedenthal, whose research on emotions has established three major types of smiles: dominance (meant to convey status), affiliation (which communicates a bond and shows you're not a threat), and reward (the sort of beaming, toothy smile you'd give someone to let them know they're making you happy). The researchers stressed out 90 male college students by giving them a series of short, impromptu speaking assignments judged over a webcam by a fellow student who was actually in on the study. Throughout their speeches, the participants saw brief video clips they believed were their judge's reactions. In fact, each video was a prerecorded version of a single type of smile — reward, affiliation or dominance. Meanwhile, the researchers were monitoring the speakers' heart rates and periodically taking saliva samples to measure cortisol, a hormone associated with stress. "If they received dominance smiles, which they would interpret as negative and critical, they felt more stress, and their cortisol went up and stayed up longer after their speech," says Niedenthal. "If they received reward smiles, they reacted to that as approval, and it kept them from feeling as much stress and producing as much cortisol." The effect of affiliative smiles was closer to that of reward smiles — interesting, but hard to interpret, Niedenthal says, because the affiliative message in the judging context was probably hard for the speakers to understand. Other research has shown that people with greater variation in the rate at which their hearts beat are better able to understand social cues such as facial expressions. "People vary in how tolerant or capable they are at sitting with and understanding or engaging with social information," says Niedenthal, whose research is supported by the National Institutes of Health and National Science Foundation and U.S.-Israeli Binational Science Foundation. "The thing about your body that permits you to take in the information and process it fully, or make sense of it, is the functioning of your parasympathetic nervous system, which manages your breathing and heart rate and allows you to be calm in the face of social information." Smile study participants with high heart-rate variability did indeed show stronger physiological reactions to the different smiles. But, Martin says, heart-rate variability is not innate and unalterable. In fact, a long list of disorders — obesity, cardiovascular disease, autism, and anxiety and depression among them — can drag down heart-rate variability. That may, in turn, make people worse at recognizing and reacting to social signals such as dominance and reward smiles. "We are all individuals walking around in the world with different bodies. You may be really anxious. You may be in really good shape," Martin says. "Those things that we carry around with us change the way we perceive the world in very sensitive and personal ways." This research was supported by grants from the National Institutes of Mental Health (T32MH018931-26), the National Science Foundation (1355397) and the U.S.-Israeli Binational Science Foundation (2013205).